Autumn is the time for my Open Studio. I exhibit new work and on the studio shelves have what remains of last year’s work at reduced prices. Open Studio is a time to take stock and to see what I’ve achieved in the last twelve months. I decided to exhibit less in 2012 and to spend more time in the studio developing a more coherent body of work and solving technical problems. My big problem was glaze. 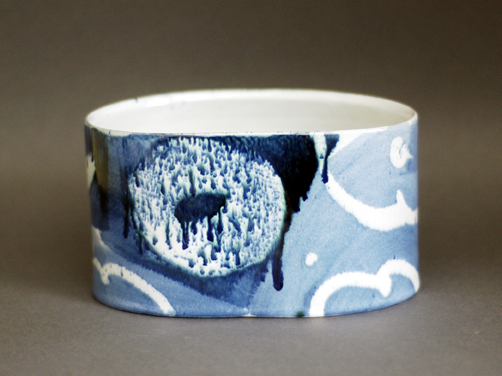 I use a lead borosilicate tin glaze that had been giving trouble for a long time. Someone said that there are no hiding places in an electric kiln. 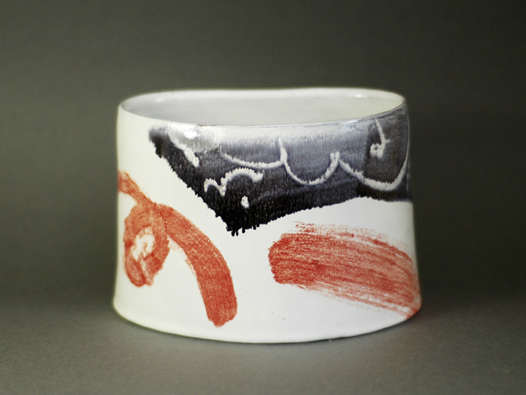 Faults, especially in an earthenware glaze, are obvious and can’t be passed off as interesting kiln effects. Tin glaze has a horrible tendency to crawl, and mine crawled so badly that sometimes the entire firing had to be thrown away. Books on glaze faults will tell you that crawling is caused by dust or grease on the surface of the pot. If only it were that simple! In my case I had to examine the physical causes of crawling, i.e., what it was in the glaze that made the particles stick to each other rather than to the surface of the pot. That took me into the delightful science of glaze rheology, which we never touched on in my BA Ceramics course. Rheology is the science of flow. I solved my problem by attacking every possible cause, which either alone or together was causing me to tear my hair out. 1. Change the materials. After consulting other tin glaze potters, I found that my lead bisilicate was being ground to a finer particle size. A fine ground glaze is one of the causes of crawling. The maker had changed from wet milling to dry milling. The only supplier of wet-milled lead bisilicate I could find was Potclays of Stoke on Trent. 2. Change the clay body. I used terracotta, but I now use a mix of three parts white earthenware to one part terracotta, which gives a pink clay like Italian maiolica. The glaze doesn’t have to be so thick, and that might help adhesion. 3. Change the water. I live in an area where there is a lot of calcium and magnesium in the tap water. These minerals flocculate the glaze, i.e., make the particles stick together, which means greater viscosity. I now use de-ionised water. As a result, the glaze materials go straight to the bottom of the bucket and they then have to be flocculated with Epsom salts. It may seem crazy to deflocculate and then to flocculate, but it works. Another change I’ve made is to mix my colours form raw oxides and, except for red, not from commercial stains, which are too stable. In the gestural, abstract painting I do, I want colours that will run in the kiln (left), not inert ones. I’ve also developed a vocabulary of design and a range of shapes that works for me, and they’ve been well received. My studio is open on Friday 21st September, Sunday 23rd, Friday 28th and Sunday 30th from 10am to 5.30pm. For further details, you can-mail me here.